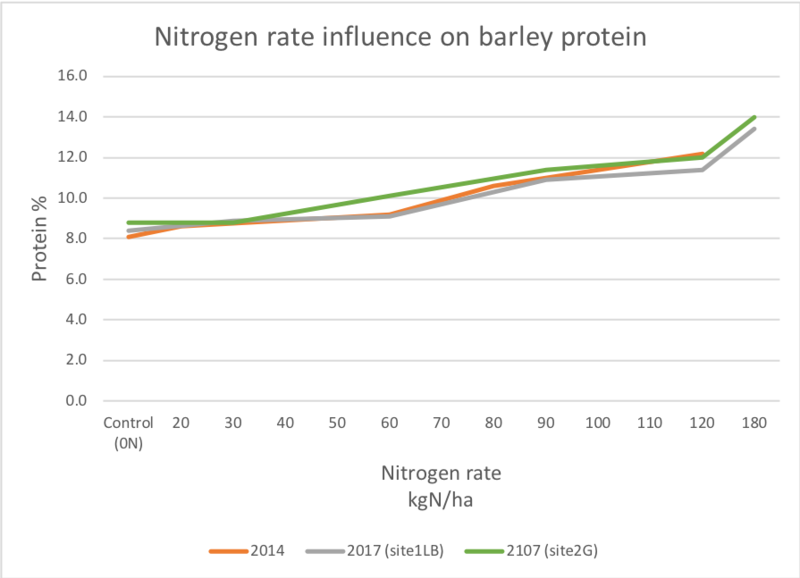 The results highlight the importance of nitrogen in reaching yield potential and achieving adequate protein levels with low screenings (see results over page). 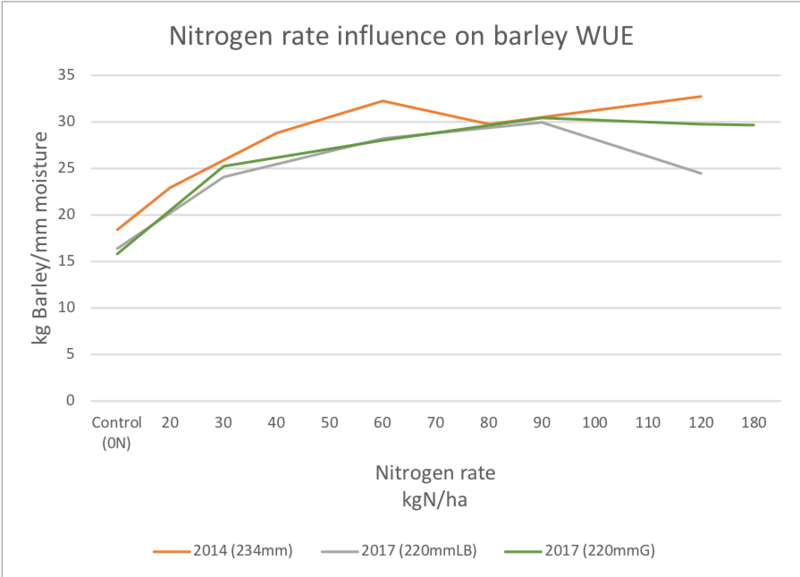 In addition, the trials show consistent relationships between nitrogen rate and water use efficiency (WUE). Maximising the conversion of moisture to grain is a key goal in dryland cropping and nitrogen can help with this. While there are many things we can learn from these trials over the years, here are a few key points to consider for this season. 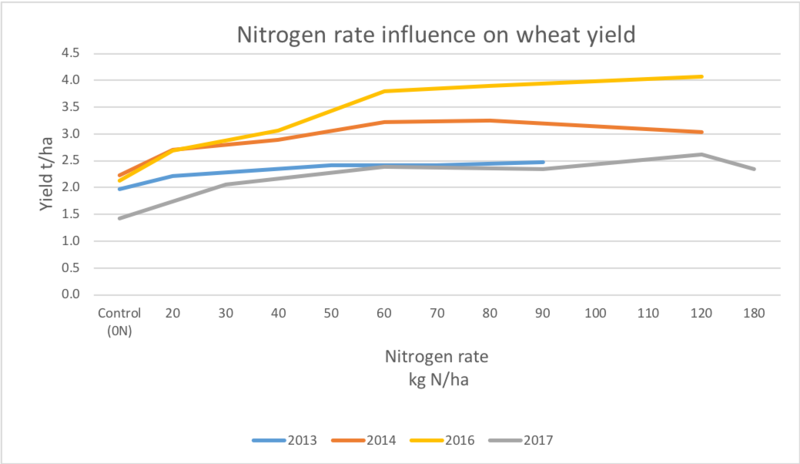 The first 30 to 40 kg/ha of nitrogen (65 to 87 kg/ha of urea) provides the greatest yield gains over control. In higher rainfall years, or where there is stored moisture, at least 60 kg/ha of nitrogen (130 kg/ha of urea) is required to maximise yield. Early applications prior to fully tillered growth stage are essential to maximise root development and shoot density. Taking advantage of early season rainfall events to apply nitrogen is critical. Start the program when you can. Given low soil mineral nitrogen levels, there is no risk of haying off with 30 to 40 kg/ha of nitrogen, even in below average seasons. 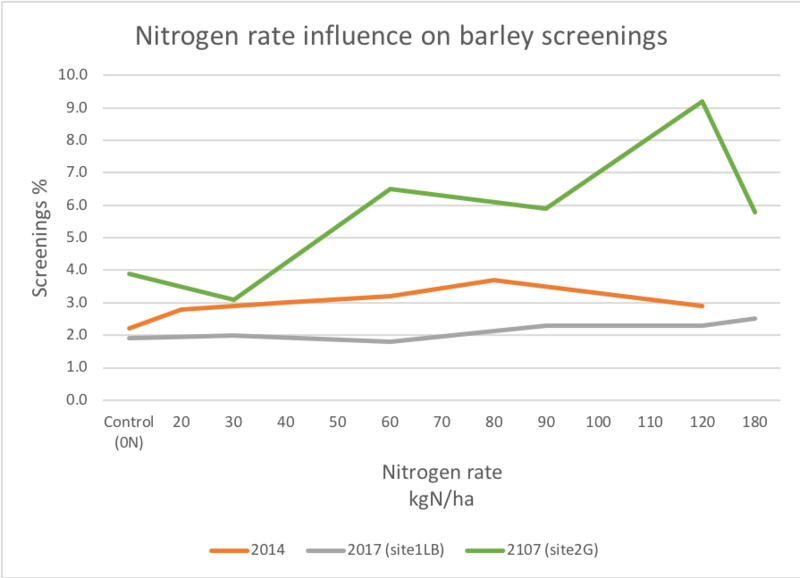 Screenings tended to be lower with increased nitrogen rates in these trials. Water use efficiencies increased with nitrogen rate. Be aware of variations in moisture availability across different soil types. Maximising yield at >10.5% protein is a key driver to profitability. To maximise yield, protein needs to be >10.5% or APW quality. 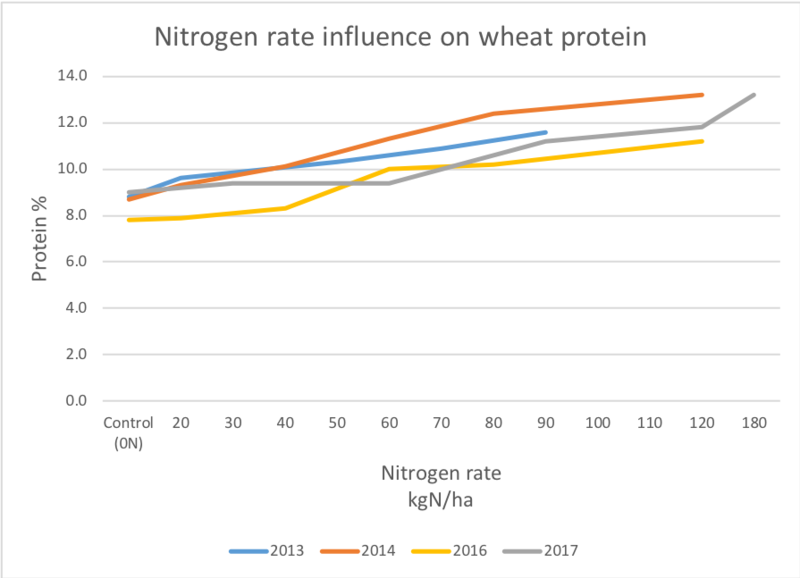 In the trials, applying nitrogen above the optimum rate was more profitable than applying nitrogen below the optimum nitrogen rate. 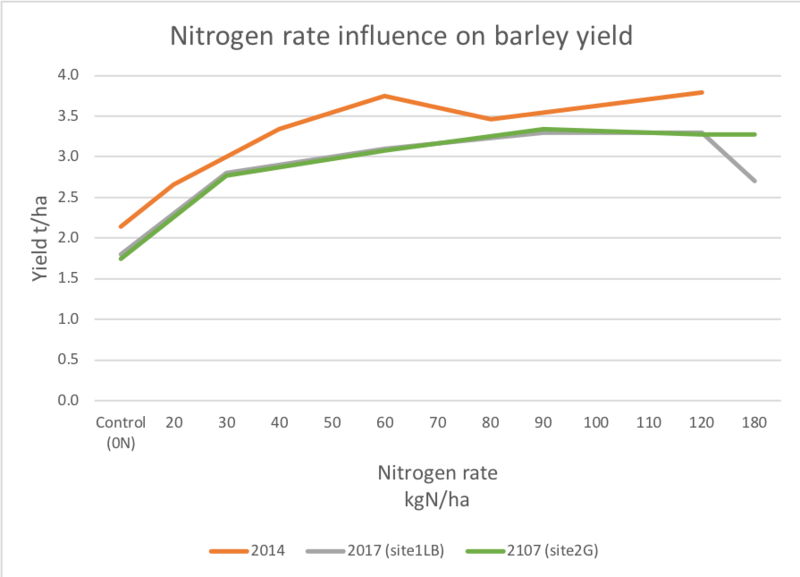 The first 30 to 40 kg/ha of nitrogen provides the greatest yield gains over the control, but in higher rainfall years, at least 60 kg/ha of nitrogen is required to maximise yield. To maximise yield, protein needs to be more than 10.5%. In the trial crops, this generally took 70 kg/ha of nitrogen. 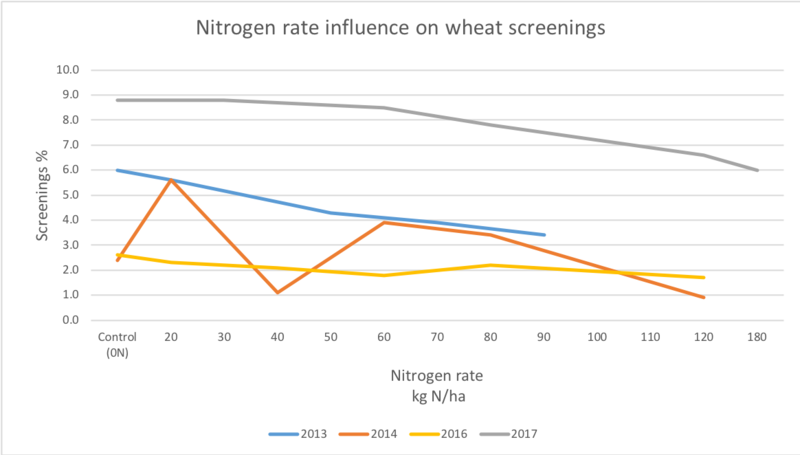 Screenings trended lower with increased nitrogen rates. 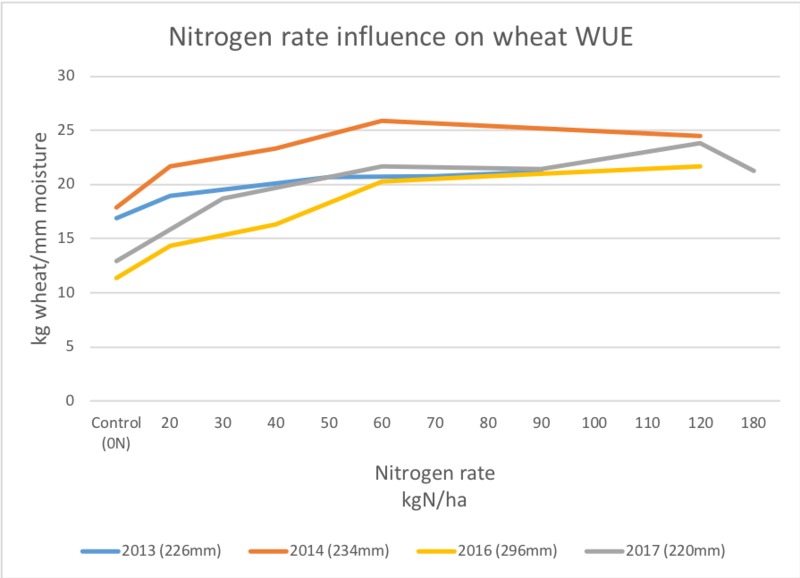 Using a basic water use efficiency calculation for each trial year shows the value in managing nitrogen rate to better utilise moisture. Note: Based on non productive moisture 110 mm, GSR April-Sept and stored moisture at 30% of summer rainfall.